It's no secret - I love to eat. I mean, I really really love food. I'm a self professed foodie. When I find something that I love, I want to share it with the world! Top Left - Sparkling Cranberry Juice by Ocean Spray. I love cranberry juice. It is sweet without being overly sweet, good for you, and an excellent alternative to Diet DP, which is one of my addictions. When I saw the clever commercial for the sparkling variety, I had to try it. I LOVE IT! It's crisp and refreshing and great for these insanely hot Texas summer days we have been having. Top Right - Speaking of hot summer days, what summer day would be complete without a cold, ice cream treat? Thankfully there is an incredible Skinny Cow product that satisfies my sweet tooth while helping me to maintain my girlish figure, haha. They are SO good - you would never know they were diet. Skinny Cow also makes a candy product that I could probably eat a whole box of in one sitting, it's that good. 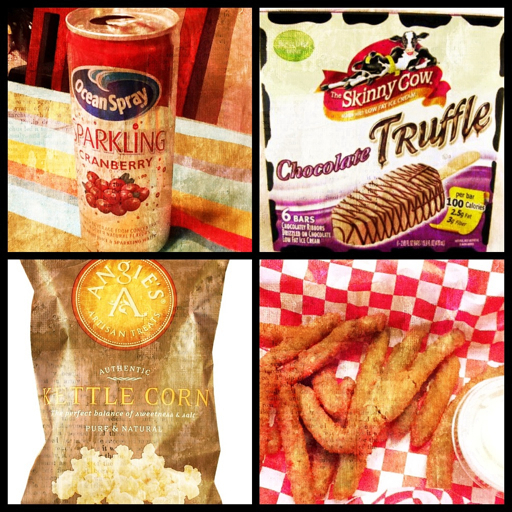 Bottom Left - Angie's Kettle Corn. I discovered this product from a sample at Central Market and I am hooked. There is something about the combo of sweet and salty that just makes me happy. Bottom Right - If you live in Dallas, you should definitely check out Luckie's on Davis in Oak Cliff. To be honest with you, I am not a huge fan of actually eating in the restaurant, especially when it's hot out. But their food is awesome. These are their fried green beans - oh. my. gosh. Thinking about them makes my mouth water, haha. Try their pulled pork sandwich and fried green beans. You can thank me later. Ok, now all this talk of food has me hungry! Time to go meet my BFF for some back to school shopping!